Got this for a buck at the local beer store. A dollar well spent. Look: Clear gold colour, foamy head. Taste: Same as smell, with a little more grain coming through. Overall: A solid inexpensive beer perfect for warm weather. 5.0% abv. "GERMAN BEER AUSTRALIAN HARD ROCK"
Appearance: Clear golden body. Rocky white head. Very good head retention and lacing. Aroma: Fresh. Clean. Floral and grassy with some minor pils malt. Mouthfeel: Medium-light in body. Surprisingly soft and smooth, moderate carbonation. Flavor: Pils malt is the main component, followed by some delicate hop flavor and lightly spicy & grassy hops. It's not very hoppy, and not very bitter - hardly what I'd expect from "AC/DC" (on the other hand, Malcolm did turn 60 a couple of weeks back), but it is well-balanced and well-rounded. I'd imagine that you could drink a lot of these, and there is some character to it, so I don't think you'd go longing for more. If that was the aim, they've nailed it. Overall: Gimmicky? Yes. But I just couldn't pass it up, and I only paid €,79 for it, which is €,11 less than the Evian water I bought, so it's not like it's really over-priced because of the name. At the same time I also bought three cans of beer in the standard ,5l size for €,28, €,33 and €,39 but they weren't as good. So, given the opportunity again I'd just buy the AC/DC beer. It's not great, but it's still pretty good. And the can "goes to 11"! Clear yellow lager with a tall white colored head. Smells or toasted grain and grassy hops. Pretty much your standard European Lager so far. Starts out mild with a taste like the smell, toasted grain and mild hops, light bitterness. That is about it, mild inoffensive lager. Overall just a European Lager in a can. I have been a rocker since I was a kid, but when I reached teenage status, I got into heavy metal, first, and later, punk. We listened to AC/DC until our ears bled & there is a great cover band, Back In Black, that routinely plays at one of our local live music venues, The Village. Most people know of my alter/altar ego of Bro. Woody of the Order of Disorder and one night, following a fest, I headed over for the show, still wearing my robe. One regular saw me and dubbed me "The Metal Monk". Ha! Stand back, lads! This review is going to be LOUD! From the CAN: "German Beer Australian Hardrock"; "Brewed in Accordance With the German Purity Law"; "Rock or Bust"; "Rock or Bust[;] Play Ball[;] Rock the Blues Away[;] Miss Adventure[;] Dogs of War[;] Got Some Rock & Roll Thunder[;] Hard Times[;] Baptism By Fire[;] Rock the House[;] Sweet CANdy[;] Emission C[AN]trol". The Crack! was as loud as thunder & I did a dirty deed by performing an inverted Glug. This was like setting off T.N.T. & I had to back off before everything exploded! The three-plus fingers of foamy, rocky, bone-white head glared at me like I had done something wrong. Hell's Bells! I wish that I CAN tell you that the color was Back In Black, but instead, it was Straw-Yellow (SRM = > 2, < 4) with NE-quality clarity. Nose had a honey-like lager sweetness & although some CANsider Lagers to be hell(es), I know that Hell Ain't a Bad Place to Be! I was having trouble with that high school head, since it simply refused to drop and so I dialed 36 24 36 and got my mate, Angus, who is always home. He came straight over & put it right and before he left, he told me, "For Those About to Drink, I Salute You!" Some great sticky lacing began to form in the glass. My next door neighbor, Rosie, stopped by for a drink, and she is a Whole Lotta Woman, I tell ya! We agreed that the mouthfeel was slightly thin, not watery, but not more than thin. Taste was definitely a clean, adjunct-free lager & after the early days of The CANQuest (tm), I truly appreciate such things. It had a honey-biscuit flavor that would be great on a hot day or in a live music venue. The finish was in that Twilight Zone between semi-sweet & semi-dry. It was highly refreshing in total. I was also beginning to appreciate Rosie's overtures, so we drank up. I was Hard as a Rock, so I broke out the Big Gun & she Rocked Me All Night Long. We Got Big Balls here at Chez Woody. A - Bright clear gold pour with a micro thin white lacing ring, NO carbonation. S - Grainy, lemons, earthy, biscuity crackery malt. T - Lemons, slightly musty, very grainy, some caramel malt on the back end, and a biting citrus bitterness. M - Thin body, minimal carbonation, somewhat creamy in the body. O - Best for a hot weather beer and to quaff. 568 ml. can. Pours a straw yellow colour, with a small head that dissapears in a minute, leaving a ring on the border. Smell of canned beer as it used to be canned beer years ago, medicinal, some grain and maybe flowers. Medium to light body and thin palate. Taste is metallic, herbal and some masty sweetness. I'll keep the can, but if I drink another one it has to be in an AC/DC concert where they only sell this beer. Wait... maybe is why they made this for? 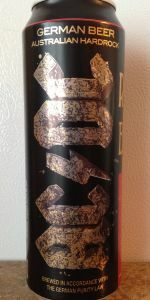 So, this is the AC/DC Beer, packaged in a tall boy 19.3 oz. can with two inch letters emblazoned up and down on both sides. I am not expecting to love this, but like The Trooper, you kind of have to try it at some point while rocking out to the tunes. Pours straw colored and crystal clear with tons of visible carbonation and almost no head but a pencil thin lace from the nanosecond the head was intact. Nose is grainy and barely hopped. The taste imitates the nose of grainy blah until a late bitter kick that gives this a touch of creativity and flavor. Overall a bit too much carbonation leaves the finish watery and a little sour. Didn't exactly rock me all night long, but not awful for what it is. A: The beer is crystal clear yellow in color and has a moderate amount of carbonation. It poured with a finger and a half high bright white head that died down, leaving a thin layer of bubbles on the surface and a small collar around the edge that extends up into some lacing down the sides of the glass. S: Moderate aromas of bready and cracker malts are present in the nose. T: As in the smell, the taste starts out with flavors of bready and cracker malts and light bits of associated sweetness. Hints of floral and grassy hops are present, but these only contribute a slight amount of bitterness. M: It feels light-bodied (but not watery) and clean on the palate with a moderate amount of carbonation. The finish has slight hints of dryness. O: This lager is quite easy to drink and doesn't have any off flavors like you would normally expect from beers in this style, especially the ones that come in green bottles. From 19.21oz can into 10oz goblet. Poured a clean, clear pale golden yellow with about 3/4 inch of white head that quickly dissipated and left no lacing. The aroma was typical, light grain, with some gentle hops. Taste was pretty much the same, with a bit of sweetness on the back of the palate. Drinkability was good, the beer went down quick and easy. Overall, not a great beer, and not a terrible one. worththe couple bucks for the tick. An overrated brewery making a beer after an overrated band, don't expect much from this. Pouring from the can forces a big frothy 1.5 finger head that fades semi slowly with tons of messy soapy lacing. Super crystal clear pale color. Nose starts with lots of toasty straw, lager pilsner malts, sweet lager malts, into mild minerality, a little skunky sulfur note in the background, little grassy hop. Taste brings mild toasty grainy malt, straw again, little sweet but dry soft lager, nice at first, but then again mineral with little sulfur skunk note, weird bitter mineral thing, gypsum chalk or something. Touch grassy hop, cereal dust and paper. Finish little sticky, weird bitterness, icky mineral and husky straw paper dust lingering, corn stalk too. Mouth is med to lighter bod, decent carb, sticky weird finish. Overall as expected pretty fail. 568ml (an Imperial pint, I'm guessing), tall sleek can - mine is subtitled 'Rock or Bust' (the name of the eponymous rock band's current touring album), with the song listings printed on the label. This beer pours a clear, pale golden yellow colour, with four fingers of puffy, frothy, and mildly chunky eggshell white head, which leaves a bit of splattered snow rime lace around the glass as it slowly and steadily recedes. It smells of bready, slightly doughy pale malt, wet breakfast cereal and the box it comes in, a touch of overripe apple flesh, and plain leafy, weedy, and moderately grassy hops. The taste is more of the same - grainy, bready pale malt, a hint of yeasty gasohol, stale cereals, ethereal apple and pear fruity notes, and some weedy, musty, and dead grassy hop bitterness. The carbonation is very tame for this sort of thing, what with its generic, and hard to sustain frothiness, the body a so-so medium weight, and kind of tacky in its more miss than hit smoothness. It finishes off-dry, the soggy cereal malt thankfully having mostly shed that initial cardboard pithiness. Hmmmm - 'rock', or 'bust'? I have to say that this one leans quite heavily towards the latter - not much to recommend it by, with more than a few cracks evident. Maybe easy enough to pound back for a music video shoot, or the like, but not something I'd go out of my way for, in terms of product quality (I await my rock 'n' roll damnation, forthwith). A: Pours a crystal clear medium yellow in color with light amounts of active visible carbonation and faint golden yellow highlights. The beer has a two finger tall sudsy foamy bright white head that reduces to a large patch of very thin film and a thin ring at the edges of the glass. Light amounts of lacing are observed. S: Moderate aromas of bready and cracker malts with a light aroma of floral + grassy hops. T: Upfront there is a moderate flavor of bready and cracker malts with a light amount of corn-like sweetness. That is followed by light to moderate flavors of floral + grassy hops which impart a light amount of lingering bitterness. M: Light to medium bodied with moderate amounts of carbonation. Clean with very light hints of dryness in the finish. O: Easy to drink and enjoyable with clean flavors. Definitely worth a try. This lager had a bright light yellow color with excellent clarity and a tall white foamy head. The aroma has notes of light malt and floral hops. The flavor is clean and matches its aroma with light cracker like pale malt and floral hops. The finish has a good balance of bitterness that quickly fades of the tongue giving it a snappy refreshing feel.